Parrot Beak drum-handlers Archives - Liftomatic™ Material Handling Inc.
Go Ahead…. Take it for a spin! Liftomatic has long believed that the Parrot-Beak® drum handling products will truly and dramatically improve a customer’s drum-handling abilities. Our sales team has it easy, because we’re selling a product that works time and again, and we have the repeat business to back it up. However, that old saying “if it looks too good to be true, it probably isn’t” has a way of making people wary when the pitch seems to be so positive. Fortunately, there’s a great way to overcome these reservations: the industry-leading Liftomatic trial policy. Separate from our rental program, which allows customers to rent products on a weekly basis for short term drum handling needs, the trial program is free. This is only possible because we believe in our products – and know that once your team has had a chance to work with Liftomatic equipment for ten days without the pressure of a sales team’s presence, it will fit so naturally, and improve the way you move drums to such a great extent that you’ll never want to give it back – though of course, that option is there. It’s always a proud moment when a prospect who has opted to take advantage of the trial program ends up buying the unit they’ve received and becomes a customer– it affirms our belief in Liftomatic products, and the validity of our claims to provide marked improvement for your drum handling operations. We know it’s not every company that can truly see such measurable results from their business, and consider ourselves fortunate that we have the regular opportunity to hear how well the products work for your organization. So to those skeptics who tend to ascribe to the “too good to be true” mentality, we say, “once you try it, we bet you’ll want to buy it!” Be sure to contact us today to talk about how Liftomatic can help your business, and stay tuned for our upcoming blog series where we’ll dig deeper into the specifics of the ROI you’ll get with Liftomatic! Planned by American engineers and built by Central American laborers at the start of the 20th Century, the 77.1 km Panama Canal ushered in a whole new era of opportunity for global trade. Suddenly, in one grand swoop, the world’s merchant marine didn’t need to round Cape Horn at the tip of South America in order to get from Atlantic to Pacific, and/or vice-versa. As a result, new ports and markets were accessible to the free market’s ups and downs in a way that was without precedent. 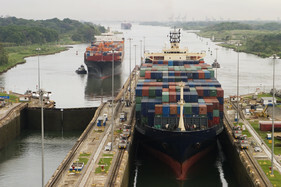 While the Panama Canal (and the Suez Canal in Egypt) continues to provide easy passage for a large percentage of the world’s mercantile fleet, a growing number of late 20th century and 21st century “super-tankers” are just too bulky to navigate through the canal’s locks safely. Of the 50,000-odd commercial shipping vessels operating today in the world, a minority are super-tankers. While these ships, nicknamed “Panamax” or “Post-Panamax” vessels, constitute a minority of the total number of merchant boats afloat, they also happen to carry a disproportionately large percentage of the world’s total cargo tonnage. Furthermore, these same super-tankers supply a whopping percentage of the world’s total supply of oil and fuel. Without super-tankers operating in the game, the world’s economy would come effectively to a halt. Efforts currently are underway to upgrade the Panama Canal to meet the standards of today’s merchant marine. In a referendum approved by 76.8% of Panamanian voters, the Republic of Panama adopted a resolution that would expand the Canal’s width and depth at several crucial points, thereby allowing it to accommodate the 37% of the world’s shipping that would else wise no longer be able to navigate its full course. Being that we at Liftomatic are in the business of supply drum handling and lifting equipment to some of the world’s foremost ports and companies, and being that so much of today’s total steel drum barrel traffic comes in the form of oil barrels, we can’t ignore these developments – if simply on the behalf of our client base. The world is changing. Yesterday’s feats of engineering are beginning to look like flyweights in comparison with the engineering of tomorrow. Everyone who wants a seat at the table in determining the course of maritime trade for the next century should be paying attention to Panama. 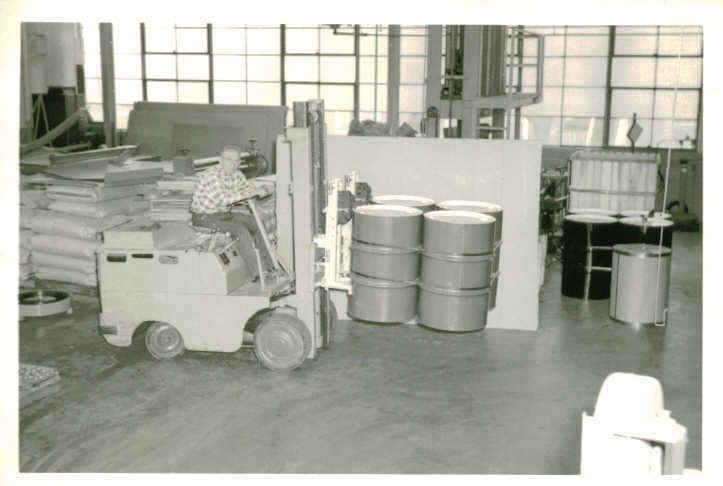 One of the early 2-FTA models on a forklift with four drums strapped together - circa 1957. As we talked about earlier, Liftomatic got its start in 1947 when a small group pooled their resources together around a great idea, bought a fair amount of military production equipment at a discount (production equipment that no longer had any use after World War Two) in order to help produce it, then established a factory in Chicago to help the process get rolling along. The massive volume of steel drum containers generated by the war had turned steel drums into the standard means of international shipping. Armed with its first great innovation, the Parrot Beak drum-handler, Liftomatic knew that the market for its products would be big to say the least. Obviously, the war spurred the development of other post-war industries beyond just drum handling. For instance, the war had made it necessary for heavy equipment handling technology to be developed and produced rapidly. One such company, Clark Material Handling, profited heavily from furnishing Allied armies with its forklift trucks and tow tractors. It was widely reported that by war’s end Clark had produced somewhere around 90% of the total number of forklift trucks and tow tractors in the Allied arsenal. Just like the steel drum container, the forklift became ubiquitous in American warehouses and factories after the war. With the advent of the Korean War in 1950, American armies again found themselves hauling steel drum barrels in vast numbers as a means of re-supply. Unlike the previous war, American forces began the Korean conflict with a huge number of forklifts. But the more things changed, the more old problems re-surfaced. The American military experienced the same accidents with steel drum barrels on forklifts that they’d experienced previously with hand-carts. Bulky and unwieldy, the drum barrels fell. A new solution for a new era needed to be implemented. That’s where Liftomatic came to the rescue again. The military was already using our Parrot Beak drum-handlers to lift individual drums. Why not use our Parrot Beak technology on the fronts of forklifts? We quickly developed and began supplying the American armies in Korea with forklift-mounted drum handlers. These new handlers were capable of carrying a much larger volume of cargo: steel drums could now be lifted four at a time when needed. They were ideal for the huge ongoing supply operations the US 8th Army had going in Pusan, where one forklift could easily be tasked with handling thousands of drum containers per month. Thus it came about that a Liftomatic product was actually essential in helping the US achieve victory on the Korean peninsula in 1953.